Fat Frocks: What's in a name? I picked up this dress on the weekend when Dorothy Perkins had a 20% off sale (they always seem to have them don't they?) and I love it. It comes in all different colours so I had a hard time choosing but I thought the stripes were nice and summery/nautical. 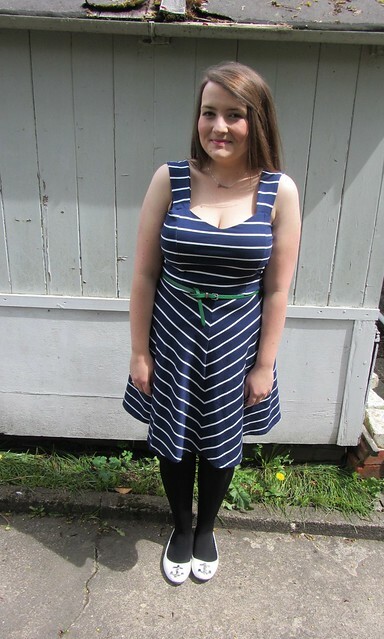 I love the shape on this dress, the neckline is very flattering and it fits very well. I may invest in another colour too as this dress is pretty versatile. The thick straps are great, I hate it when you can see my bra straps underneath which isn't classy at all. Please ignore the silly tan lines I got on my arms whilst cycling around Amsterdam, I spent Saturday in the garden trying to get rid of them to no avail. I have red arms and everything else is deathly white, sigh. The necklace was a bit of a treat to myself as I've wanted one for ages. 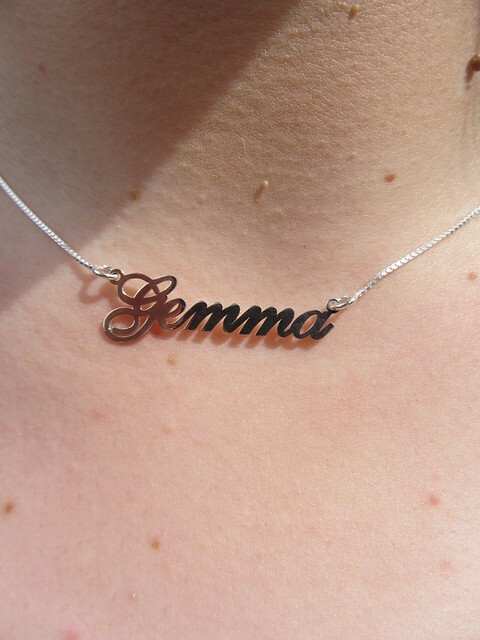 I used to wear my Tatty Devine one every day in uni until I snapped it and was devastated. This silver version is a little more grown up then my old pink plastic one and I'm not allergic to silver so yay, I can wear it all day. You can use GIFT or WELCOME for a 10% discount if you wanted to get one. I also bought one for a friend who lives in Australia and sent it via Parcelforce so it arrived in time for her birthday. I'm quite tempted to get a gold one with just my initial on too but that might be overkill as I wear my Daisy alpha ring with a G on every day. I'm currently worrying because I'm doing a presentation on Friday at a library event, I love talking but I hate public speaking. Luckily the talk is about blogging and how libraries can use it to engage with their users so I shouldn't go too far wrong. Do you have any tips for me? I've not really done anything like this before, lots or external people will be there and I'm scared. Good luck on Friday! I'm useless at public speaking so have no advice to offer I'm afraid. Just be yourself and you'll be fine. You are a bad influence! I immediately hopped over to the DP website and bought the dress, and then the necklace! Ooh I do tend to rush so good idea, slow it down. I have about 30 minutes to fill eek! That dress is super cute! It looks fantastic on you. - Don't over practice the speech! If I rehearse more than 3 or 4 times, I freak myself out and start stumbling over words. So sweet - I like that you teamed it with white slip-ons. Good luck with your presentation - I'm sure you'll do fine. Cute dress! And love the anchor shoes! DP's always seems to have an offer on. I have one of those necklaces from them as well! Hope your presentation went well! 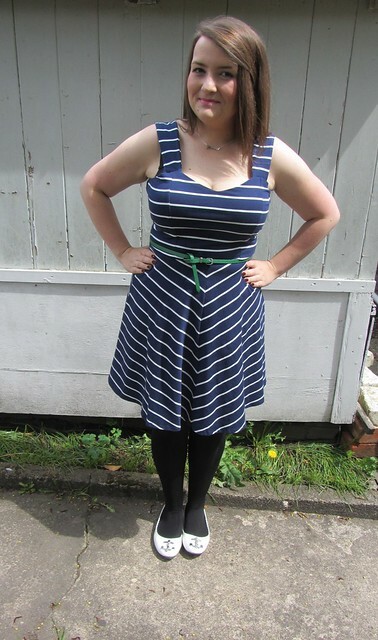 Love this dress on you, I can;t get enough of stripes!